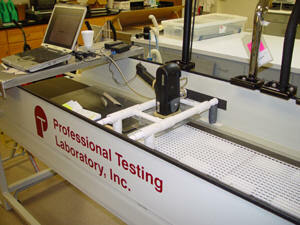 PTL tests products for compliance to manufac­turers’ construction specifications. A variety of methods are available to measure the physical properties of materials such as weight, thick­ness and density. Electromechanical test systems are used for evaluating performance proper­ties of various materials. Tensile or compres­sion strength, tear resistance, breaking strength and elongation are among those prop­erties measured on precision equipment.